This is Samer Restaurant on Nablus Street in Ramallah, not very far from the Muqata’a — and that is Samer himself, opposite Kerry. This photo is posted on the US State Department’s Ramallah May 23, 2013 Flickr set, here. Full disclosure: I bought a grilled chicken last night from Samer! He treated a few Palestinian small businessmen as if they were…well, normal people, people that anyone could have a pleasant interaction with on a sunny spring afternoon, not people who are scary or who should be locked up behind checkpoints. The State Department photo appears in their Ramallah May 23, 2013 set on Flickr here. UPDATE: A Ramallah taxi driver told me he noticed the whole street was closed with lots of security + presidential guards, so he quickly turned to an alternative route. The whole visit lasted mayhbe 15-20 minutes, he said. 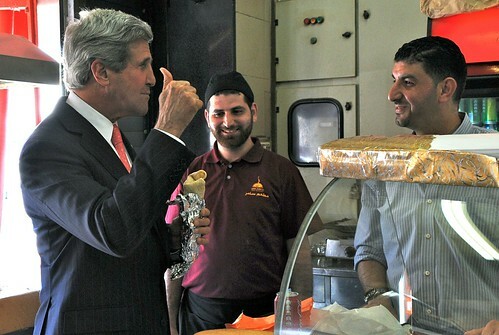 UPDATE: Ma’an News Agency later reported here that “Kerry’s tour [n.b. – he also visited Samer Sweet Shop across the street] followed a meeting with President Mahmoud Abbas in the latter’s office in Ramallah. Several officials attended the talks including PLO secretary Yasser Abed Rabbo, Executive Committee member Saeb Erekat, Abbas’ spokesman Nabil Abu Rdeina and a presidential adviereser on economic affairs. Abbas told Kerry the Palestinians were serious about resuming peace negotiations to save the two-state solution. The president also addressed ongoing settlement expansion and settler assaults against the Palestinian people in the West Bank”. It was reported this morning here that the Palestinian Authority [PA] Foreign Ministry urges the UN to protect Palestinians — from “Israeli settlement building and aggression”. He may have a point, especially in light of two excellent pieces of reporting today by Chaim Levinson in Haaretz, the most disturbing of which, published here reveals Israeli “plans to start compiling land registry records of assets controlled by settlers [in the West Bank]…[to] bypass regular tabu land-listing processes”, which, Levinson writes, “appears designed to prevent Palestinians from appealing the validity of the ownership listings”. Among other things, this seems to suggest a slide towards extension of Israeli civil law in the West Bank — or at least the outline of a new Israeli move to annex parts of the West Bank, which has been hinted by officials and others with increasing frequency in recent months. Some will say, though, that “creeping annexation” is nothing new. Levinson’s other piece, as complex as the subject matter itself, is published here, and reports that “Residents of the condemned West Bank outpost of Migron have appealed the High Court to stay the demolition of the settlement’s illegal structures on Tuesday, claiming that they had recently purchased the land on which the homes were built. However, a preliminary inspection of the purported sale reveals that the Palestinian whom the settlers claim sold them the land passed away in 2011, one year before the alleged transaction”. This has happened before, but there appear to be several new twists in this case. But, it does seem absurd for the PA to be asking the UN to protect Palestinians as its security forces beat protesters brutally on Saturday and Sunday — reportedly in violation of an instruction given by the PLO Executive Committee itself. On Satuday, plainclothes men [whose existence wass later denied, despite ample photographic evidence] attacked demonstrators who were then arrested by uniformed police in broad daylight in downtown Ramallah [and then beaten some more]. See our previous post. And, at the same time, hundreds of Palestinians in the West Bank have been arrested and jailed in recent months, either by the IDF or by the PA. The Jerusalem Post’s well-connected defense correspondent Yaakov Katz wrote a piece, just posted here which reported that “An ongoing Palestinian Authority crackdown on crime and corruption in the West Bank, including the arrest of senior security officers, is being viewed in Israel as a milestone for the PA as it imposes its rule and authority throughout the territory”. Katz’s piece in the JPost goes on to say that “A senior IDF officer from the Central Command said the operation was yielding impressive results and was viewed as a possible ‘turning point’ for the PA as it tries to impose its authority throughout the West Bank”. Either the same or another unidentified IDF officer even reportedly told Katz that “If effective, the operation could be used by the PA as a key argument in its bid for independence and statehood by demonstrating its ability to enforce law and order and clamp down on corruption within government and security ranks”. Then, this JPost report adds, “The Presidential Guard, a force loyal to PA President Mahmoud Abbas, is leading the operations … While the IDF is not actively involved in the operation, it is closely following developments and has granted the PA approval to deploy additional forces in Jenin and Nablus to carry out the arrests. The Shin Bet (Israel Security Agency) has also played an assisting role in locating several Palestinian fugitives who fled from the Jenin area and returning them to PA hands”. According to the latest reports, the “Youth” protesters in Ramallah intend to resume their protests for a third day, later today. Does this man, who was accosted on a sunny Saturday afternoon in a nearly-empty street in central Ramallah — near his office — look armed and dangerous? No? Then why was he stopped by plainclothes men in broad daylight in downtown Ramallah on the fringes of a protest on Saturday, beaten, and arrested by uniformed police — then beaten again while in custody? He was covering the demonstration and, yes, he probably was somehow involved in preparations for a protest on Saturday, held nearby, against the policies of the Palestinian leadership — yes, the same Palestinian leadership which has said that peaceful protests are allowed under the Palestinian Authority [PA]. He is also a known and recognized journalist, familiar to those in downtown Ramallah, including the Palestinian security forces. These photos were taken on Saturday. “Youth” protests in Ramallah continued a second night, on Sunday night, with more beatings and injuries and arrests. The privately-owned Bethlehem-based Ma’an News Agency reported here that “Journalists were also attacked for the second day in a row, the correspondent reported … Reuters photographer Saed al-Hawari was attacked and photographer Ahmad Musleh was arrested. A camera belonging to journalist Ahmad Ouda was confiscated”. Abukhater [a 17-year-old student who just graduated from high school and a Jerusalem resident, whose father is a Palestinian journalist working with an international media organization] recounts on Electronic Intifada that: “After the police started pushing and beating protestors with sticks and batons, I managed to slip behind their line to be met with another line of police only a few meters behind. There, I was alone with my camera, I saw a guy lying on the ground being beaten by the police behind their line, I tried to take a picture but my camera was then confiscated. I was forced to delete all the pictures on my camera by the police, then my camera’s SD card was destroyed to pieces. The guy who was being beaten by the police managed to stand up – he was visibly bleeding – he was then slapped and dragged to the nearby police vehicle”. The Electonic Intifada article also provides a link to other photos of Saturday’s protest on the Facebook page, showing the action and the results, including some impressive welts and other injuries here. Whereas a year ago these “Youth” protesters were calling to an end to the division between Fateh and Hamas [including an end to media incitement and a complete release of Palestinian political prisoners being held by each side], as well as worldwide elections to a new PLO Palestine National Council, they are now demanding an end to the Palestinian Authority and the departure of Mahmoud Abbas. One Tweet on Saturday noted that Mahmoud Abbas said he would resign the moment there were two protesters in the street against him. [Mahmoud Abbas had a track record of resigning when the going got tough, particularly under the rule of the late Yasser Arafat, see our post on the upper left hand side of the page. More recently, as he has consolidated his hold on all the reins of Palestinian power, Mahmoud Abbas has much less frequently threatened to resign — but he has, once or twice, still done so, whenever donors were not coming up with the money needed to maintain the fragile ecosystem of “rule” symbolized by PA Ministries in Ramallah + security forces now permitted to operate in major West Bank cities]. Nearly a full day after the violence shown in the photo collage above, PLO Executive Committee member Hanan Ashrawi said that the Palestinian Authority police had violated instructions not to interfere with the Saturday protest, which was called to protest the invitation to Israel’s Deputy Prime Minister Shaul Mofaz to visit Palestinian leader Mahmoud Abbas in the Muqata’a in Ramallah, which was supposed to take place on Sunday, but which was cancelled on Saturday [see our previous post]. UPDATE: The Palestinian Journalists’ Syndicate said in a statement issued on Sunday that “Palestinian journalist Muhammad Jaradat was beaten by non-uniformed individuals at the protest, who referred to themselves as members of the security forces … Jaradat was injured in his left eye and had bruising on his chest, back and other parts of his body … After the beating, he was taken to the Ramallah police station where he was kicked in front of police officers who did not intervene to protect him … the assault on Jaradat breaks the government’s stated commitment to freedom of expression. They called on police to urgently investigate and punish those involved in the attack”. This is reported here. UPDATE: And, according to another report by Ma’an News Agency, “PA Minister of Interior Said Abu Ali said Monday he will form a committee to investigate clashes between police and protesters in Ramallah in the last two days … [and that] the Palestinian Authority will take all necessary legal and internal procedures in line with its commitment to freedom of expression and right to assembly. He called on all Palestinians to obey the law in order to avoid repetition of the events in Ramallah. Security forces spokesman Adnan Dmeiri had defended his forces on Sunday, saying fighting only broke out when protesters tried to reach the presidential headquarters, which police are required to stop as protesting there is forbidden. He said police were investigating who was behind the protest, saying the ‘agendas of those unknown movements are to create chaos and harm security and attack Palestinian police’. But the forceful reaction to the protests drew criticism from some Palestinian officials who said the police were under standing orders not to intervene”. So, the situation is again unclear and chaotic. It was so hot. It was the second hot day, after a long and dreary winter, one of the worst in recent years, most people here agree. * Bumper-to-bumper traffic going thru Huwwara village to Nablus after news of death of Sheikh Hamed al-Betawi – background story here. * Can demonstration of respect upon news of death of Nablus’ Hamas MP+scholar be extrapolated to predict results of next elections [if held]? * Though Sheikh al-Betawi himself was arrested by the IDF several times, the arrest of his son coming so soon after the Sheikh’s recent heart surgery could not have helped his medical condition. * Despite who he is, the Sheikh did get a permit to go for treatment to a Palestinian hospital in East Jerusalem, on part of the Mount of Olives, where he is reported to have died. * IDF presence discretely reduced along the way to Nablus [+ back], as what must have been thousands went for condolences on death of the Hamas learned scholar and MP, Sheikh Hamed al-Betawi. Rallies are taking place in cities around the West Bank today, organized by the non-official but officially-approved “National Committee – Palestine: UN State 194”. Palestine TV, which is covering the Ramallah rally live, listed a series of uninspiring speeches for demo in ex-Clock Square [now Yasser Arafat Sq] in Ramallah, then performance by Al-Ashaqeen. At the start of today’s events, Palestine TV was showing split screen: rallies in both Ramallah + Nablus. Moment ago: melodius intonation of Quranic verse. Next major demonstration planned for Friday — the day Mahmoud Abbas is due to address the UN General Assembly, and the day he has said he will present [to the UNSG BAN Ki-Moon, who must then transmit it to the UN Security Council] the official Palestinian request for full membership in the UN. Yes, there is one — just one — Picasso work on display now in the International Art Academy of Palestine (IAAP) in Ramallah. It is Picasso’s Buste de Femme (1943), which the IAAP says is one of Picasso’s “most iconic works”, on loan from the collection of the Van Abbe museum in Eindhoven (in the Netherlands). The IAAP says, in their invitation to the exhibit, that “The work is one of the most outspoken examples of Picasso’s expressionistic period — a period in which he spoke out in response to the Spanish Civil War. Perhaps through his work we are able to talk about and imagine conditions in relation to cultural rights and struggles in other places and times too”. Picasso’s Buste de Femme (1943) is on view at the IAAP in Ramallah, behind the Arab Bank branch, across from the Friend’s School football field, until 22 July. UPDATE: It is with mixed feelings that we report, on 21 July, that the IDF spokespersons unit has announced here that this exhibition of Picasso’s Buste de Femme could not have taken place without their “facilitation” and “coordination” — as if we could have forgotten, for an instant that the West Bank is under a full Israeli military occupation, and that the only real ruler of the West Bank is the Israeli Defense Minister, who at the moment is Ehud Barak. “For the past month, the International Academy of Art Palestine (IAAP) in Ramallah exhibited the $4.3 million painting, allowing Palestinians to experience the most valuable work of art to have ever been exhibited in the area. As part of a larger project, IAAP documented its experience in requesting, transferring, exhibiting and returning the famous work of art”. Apparently, the exhibit ended on 21 July (though the Palestinian announcement said it would continue “until 22 July”. The IDF press release notes that “Today [21 July], the Israeli Civil Administration assisted in the passage of Pablo Picasso’s famous painting, ‘Buste de Femme’, 1943, coordinating its shipment from Ramallah to the Netherlands“. Another useful thing we learn from this press release is that “The Israeli Civil Administration was pleased to contribute to this endeavor and will continue to assist in all future artistic and cultural efforts”. More than that, this press release gives us a very useful working definition of what the “Israeli Civil Administration” actually is: “The Israeli Civil Administration is a government and IDF body, which runs local Palestinian civil matters and cares for their well-being. The administration is composed of Israelis, Palestinians, IDF soldiers and officers and others from around the world. It does not work with Palestinians in the Gaza Strip”. Who, do you suppose, are the “others from around the world”?? ?